»Visit These Indian Monuments That Strikingly Resemble International Structures! Visit These Indian Monuments That Strikingly Resemble International Structures! The world is a beautiful place, filled with different wonders and monuments created by mankind from time immemorial. Architects and artists draw inspirations from other greater artists and create their own masterpieces that leave everybody in awe. India is a country that has been ruled by many great and powerful dynasties and the presence of which can still be seen in the form of culture, tradition, monuments and our lifestyle. Famous worldwide for beautiful monuments like the Taj Mahal, Qutub Minar and more, there are certain monuments that bear a striking resemblance to some international monuments. Read about these 6 monuments in India, whose resemblance you may have overlooked. Qutub Minar, the monument we've read about since school, has a somewhat similar looking twin at Pakistan called Minar-e-Pakistan. Unlike Qutub Minar, Minar-e-Pakistan was built in the 1960s in a blend of Mughal and modern architecture. Qutub Minar located in Delhi is a UNESCO World Heritage Site that was built in 1192 using red sandstone and marble. The marvelous monument was built by Qutb-ud-din Aibak who was the first ruler of the Delhi Sultanate. 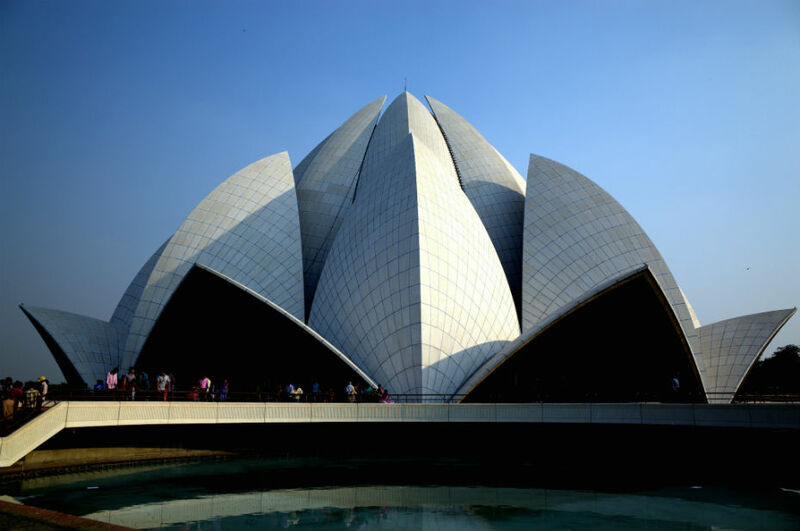 The Lotus Temple in Delhi, is a house of worship for those of Bahai faith. Like other Bahai houses of worship, the temple is open to people of all faiths. The lotus petal-shaped structure of the temple makes it an important place of attraction. It also happens to resemble the famous UNESCO World Heritage site, Sydney Opera House. The Opera House, however, is a multi-venue performing arts centre that is one of the most notable places of the 20th century. The Lotus Temple remains open from 9 am to 5.30 pm with free entry and will remain closed on Mondays. Built in 1921, India Gate was laid in the centre of Delhi, in order to honour the Indian soldiers who passed away fighting in the First World War. The structure bears a striking resemblance with the Arc De Triomphe of Paris. The Arc De Triomphe is a monument built between 1806-36 in Paris. The arch of India Gate is inscribed with over 13,000 British and Indian soldiers who lost their lives in the battle. The monument does not have an entry fee or timings to visit, it can be viewed at any point of the day. We have all heard of the Stonehenge of England, but how much do we know of Willong Khullen of Manipur? England's Stonehenge, a pre-historic monument which is one of the wonders of the world, is a group of 13-ft-high stones placed in the form of rings. Following somewhat the same features, Willong Khullen in Manipur is an unexplored territory that also consists of many stones that are randomly erected. The formation or the number of stones might not be the same, but it stands as mysteriously as the Stonehenge of England. There are as many as 135 pillars, some of them that are 10 ft high. Another wonderful monument of Delhi, the Jama Masjid is one of the biggest and most beautiful mosques of India. Built by the Mughal Emperor Shah Jahan, the Jama Masjid bears an uncanny resemblance to Badshahi Masjid of Pakistan that was built by his own son and successor, Aurangazeb in Lahore. The mosques are built using red and white sandstone and can house thousands of devotees at once. In spite of being part of two attacks, the Jama Masjid stands strong while still being one of the most important places of worship. Merged by a series of fortifications made of various construction materials, like bricks, wood, stone, etc., the Great Wall of China is a worldwide acclaimed structure that entered the New7Wonders of the World. The wall covers thousands of kilometres in length. Similarly, the wall protecting Kumbhalgarh Fort can be called as the Great Wall of India since it protects numerous fortifications and has silently been a guardian of the fort. It is not similar in length since it covers a radius of 36 km, but its enormity resembles the China Wall.